This concentrated dreamboat is undoing all the havoc you wreaked on us! Quitting shampoo ain't always easy. It is, however, the best thing you can do for your hair, scalp, and skin. talking smack about your shampoo and offered a REAL REPLACEMENT. It's time to dump the shampoo train and get a regimen that is way less maintenance and completely healthy. I haven't washed my hair in years, except for the 3-4 times a year that I get my hair dyed, and now every time I do have to use shampoo it throws off the whole system and I end up with dandruff and stupidly dry hair for 2 weeks after I wash with shampoo. I scrub my scalp every 2-3 weeks to remove oil and skin cell build-up and that's it. That's IT. I've developed this scalp scrub with dead sea salt to nourish the scalp with necessary minerals to promote hair growth and scalp health. French green clay and the salts work to remove just enough oils from the scalp and hair to keep it looking fresh and clean. A very small touch of baking soda provides a touch of astringent action and the essential oils I've added promote hair growth as well. Amla has been used by women in India for thousands of years for hair health and shine. Brain Wash is a concentrated product and should be cut with sea salt or even table salt if that's all you have laying around. Most clients do a 50/50 split. Some go as low as 30% Brain Wash and 70% sea salt. Apply to scalp in all areas by parting hair, shaking a small amount into part of hair, reparting in a new area, applying to that scalp area. Scrub areas as you go along through the whole head. Massage further as you rinse through the rest of your hair. Apply pure oils as conditioner. 1. Apply to scalp in all areas by parting hair, shaking a small amount into part of hair, reparting in a new area, applying to that scalp area. 4. Massage further as you rinse through the rest of your hair. 5. Apply pure oils as conditioner. your hair will soak in pure oil conditioners at a rate you've never experienced before! 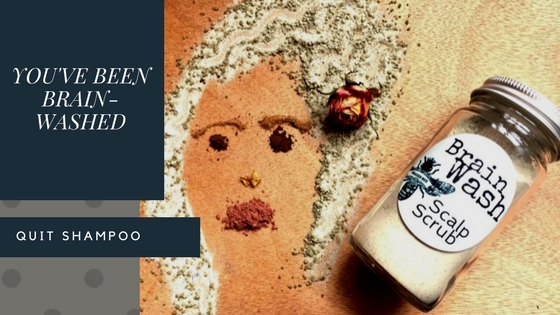 Dead Sea Salt, Sea Salt, Himalayan Salt, Amla Powder, Baking Soda, French Green Clay. I have sebhorriac dermatitis and this stuff works well and makes my hair feel so good. I’m still trying to get my ratios down and trying to slow down my use of shampooing so I don’t think I’ve reached my full potential with Brain Wash.....but so far, so good! My partner and I have been battling persistent dandruff and my partner has been dealing with it to the extent of it basically being an eczema flare. We added salt to it, one-to-one ratio, and it has been life changing. It has greatly improved the condition of our scalps and has cut the frizz down so much too. It’s a little weird and hard to get used to but it’s so worth it. When we left town for a couple of weeks to deal with a family emergency, we decided not to take it with us and near the end of the trip we could not wait to get home and use some Brain Wash and Pits n Bits. Will definitely buy again!! I couldn't even massage it in for more then a couple seconds and it felt like 100 fire ants were on my scalp!! I tried asking about it and my questions weren't answered. Also it's not white!! In the pictures it looks white mine was a brownish color. I'm very disappointed I was hoping this would be the cure to my severe dandruff problem. I feel like I wasted $20. the entire condition of my scalp has improved in leaps and bounds since switching to Brain Wash. I was finding small spots of dry and peeling skin that I couldn't explain or fix until my third use of this scalp scrub. My skin is completely smooth and my hair hasn't been this thick in years. © Brazen Bee Chelsea theme by Pixel Union, powered by BigCommerce.